Creating a sound foundation for baby and peace of mind for mom. Specifically designed to help support the nutritional needs of women during all stages of child birth, including conception, pregnancy and while nursing. 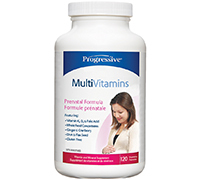 The Progressive Prenatal Formula includes a strategic blend of vitamins, minerals, probiotics, whole food concentrates, essential fatty acids and plant extracts designed to help support as many aspects of conception, pregnancy and lactation as possible. • Folic Acid – Essential for DNA synthesis and cell replication. Folic acid is recognized as one of the most important prenatal nutrients. Deficiencies have been linked to many developmental & birth defects. • Iron – Almost double the amount of iron is required during pregnancy and a deficiency can lead to anemia, difficult labor, low birth weight and premature delivery. • DHA – Important for both mother and child. Research suggests that DHA is vital for development of the brain, eyes, nerves & immune system in growing children. • Ginger Root – Used to naturally treat the nausea and vomiting associated with the first trimester of pregnancy. • Cranberry Extract – Expecting mothers are put at an increased risk for UTI’s starting in week 6 through week 24 of their pregnancy. UTI’s are common during pregnancy due to the changes in the uterus. • Vitamin K1 – Is used to control blood clotting in both mother and child. A mother’s need for proper clotting following delivery is obvious, and a lack of this vitamin in newborns can result in Vitamin K deficiency bleeding (VKDB). • Probiotics - When taken during pregnancy & lactation they help promote the immunoprotective potential of breastfeeding. Directions: Take 1 capsule with breakfast, lunch and dinner for a total of 3 capsules per day. Non-Medicinal Ingredients: Cellulose, colloidal silicon dioxide, and magnesium stearate. Contains no added flavoursm colours, sweeteners or preservatives of any kind. Caution: Consult your health care practioner before taking this product, especially if you are under medical supervision, taking prescription medication or if you suffer from a serious and/or pre-existing medical condition or if you have a liver disorder.